Why Stay When You Can Fly? This is a truly profound quote! This quote is from Harun Yahya, who is best known as the leader of a cult-like religion based on Sunni Islam. But regardless of Harun's religious views, or that he was once was, or still is, a Holocaust denier and evolution denier, this quote is nonetheless especially meaningful. Not only that, but it goes to show that whether we disagree with someone on many things, we can still draw deep and profound meaning from them. This quote in particular shows that we often view animals, and others as having more or better abilities than us. 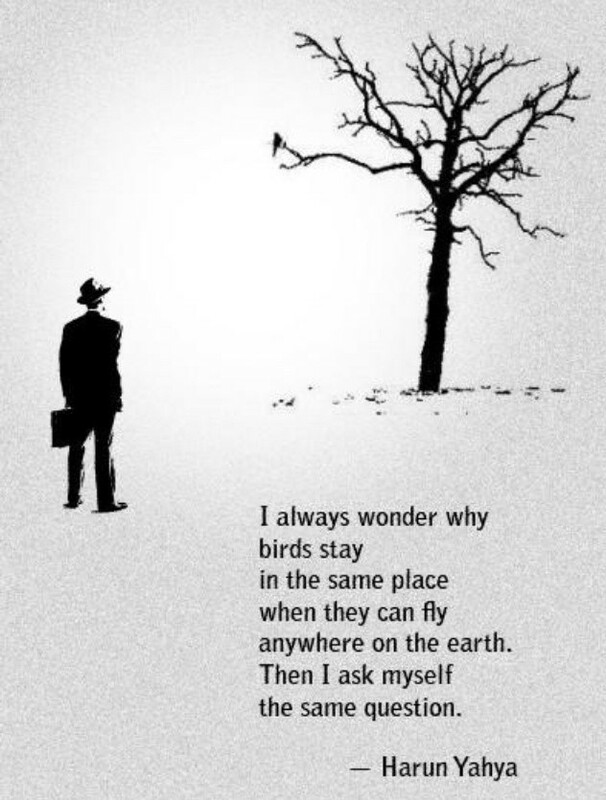 Yet just as a bird can fly anywhere around the world, so can we. Thus instead of question others about what they should do, we should always reflect upon ourselves and ask why we are doing the very same thing we ask others of!